Size matters for Citizen’s Eco-Be! 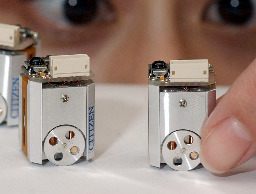 On March 6 in Osaka, Japan, Citizen Watch Co., Ltd. (Tokyo) unveiled a mini-robot driven by a small wristwatch motor. The two-wheeled robot -- called �Eco-Be!� -- is 1.8 cm wide and 2.5 cm tall and is operated via infrared remote control. At the unveiling, the tiny robot demonstrated the ability to move forward and backward, as well as turn smoothly from side to side. Eco-Be!, which is powered by watch batteries and features low power consumption, will make an appearance at RoboCup 2006 in Germany this June. Citizen president Makoto Umehara says he hopes Eco-Be! will prove useful in the development of smaller and lighter weight robots. The company will conduct further research with Osaka University to improve the robot�s performance. That is all we need, a zippo lighter on wheels running wild. Pyromania be damned. Cool, I can't wait to buy one and take it apart. Yes, yes. But, can it bring me a beer? Will it be able to IMPEACH? If that is a yes, I will take 500. There is a joint project with CITIZEN and Osaka University for developing a new platform for robot research on subjects such as swarm intelligence, artificial life, etc. This will be done initially in the form of RoboCup games. The robots will be gradually improved over time accordingly to the needs of the users community. I've always been a big fan of micro technology.But can these things carry more than 88 lbs? It CAN bring you a beer-- 1 cc at a time. What does this thing actually do? I know other simple robots can solve mazes or follow lines, but what does this little guy do? All of us have to find keep searching for possibilities in order to help save our planet. Good learning about this. All of us have to find more possibilities in order to help save our planet. Good learning about this.